Home Economy Trash talk: is Panama getting serious about solid waste? Trash talk: is Panama getting serious about solid waste? Plenty of plastic and paper along the footpath. Photo by Eric Jackson. The objective of these studies is to define guidelines to establish a national strategic plan to clean up the country through an integrated system with its objectives and the main lines of action necessary for the sustainable management of waste generated in Panama. President Varela is spending $4,354,000 via the Urban and Household Sanitation Authority (AAUD) to hire the Spanish consulting firm Ingeniería y Economía del Transporte SA (INECO) to develop a solid waste management system for Panama. We certainly need such a thing. But the thing is, INECO is primarily a transportation infrastructure engineering firm. Their website briefly mentions recycling, but all of the projects of which they boast are related to rail, highway, airport or seaport systems. They don’t seem to have any waste management system experience to show us. Perhaps they have just acquired a company that does solid waste planning, or hired some experts who are really good at that sort of thing. And surely there is an engineering component to any systematic approach to what we are going to do with all of that refuse. The way that the problem is stated belies a conceptual problem that runs from the least educated Panamanian citizen to the sophisticated individuals at the top of our government. Does a nuts and bolts plan for sufficient modern landfills with a collection and transportation system to fill them, plus a recycling plan to divert the more valuable garbage, solve our problem? Or might we power our homes and put up with the stench of burning plastic with waste-to-energy incinerators, or better yet advanced plasma burners that just give us glassy bricks and water vapor? Not enough. Oh, that’s right, it’s a cultural problem. The waste disposal people, the Ministry of Health and IDAAN have been saying that for years and better educated Panamanians have heard it. Dispose of trash in proper receptacles, not by throwing it by the side of the road or down storm drains. A lot of people haven’t assimilated the message and this time of the year it aggravates urban flooding problems and all that trash collects water where disease vector mosquitoes like to breed. But those sophisticates who see it as this problem of bad manners, mostly of those arrived in the city from the Interior in recent decades also tend to have a conceptual problem. If solid waste management is looked at as a matter of convincing people to put it in the can so that the collectors can come take it away. It’s even so if one figures that some of that stuff should be separated out and recycled. The bigger part of the problem is creating and distributing all that throwaway stuff in the first place. So has our industrial engineer president hired a company to give Panama an engineering solution to our solid waste problems? To the extent that the company gets into recycling, might they give us a market solution too? It doesn’t work without a cultural solution and a public policy solution. Education campaigns have made small dents on the cultural front. We had a mayor of Panama City who was married into the ad cartel, who went after that problem with television ads. We might want to study how well that program, long discontinued, really went. 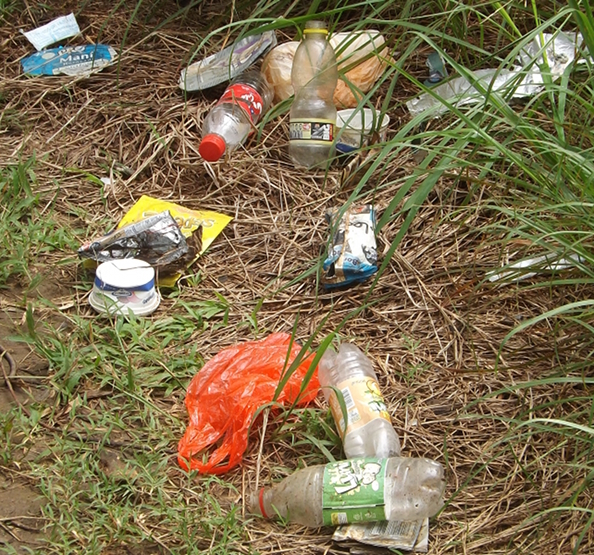 Mandatory beverage bottle and can deposits have shown in many places around the world how they dramatically decrease the volume of solid waste strewn along roadsides. We are not going to save our coral reefs or get the upper hand against dengue until we remove all the plastic shopping bags from the environment by prohibiting their free distribution at stores, as is done in China. Also on the public policy front — and let’s be frank about it, the political patronage front — is the relationship among municipal, provincial and national levels of government. For example, Chame’s private garbage pickup contractor has just called it quits, so does the AAUD now add that sprawling district to its political bailiwick? And how do we avoid the tawdry turf battles of the previous two administrations, in which contracts and jobs were more important than keeping things clean? It could could be that INECO is a competent cultural and public policy consultant, too. It could be that the president has some comprehensive cultural and public policy approaches in mind, and is just hiring INECO to study the particulars of our situation and present him with some options for the engineering parts of the solution.